I am detecting each side of collision between two rectangles, and wen I collide them, lets say, with the left side, it also detects collision on the top side when I move to the top, and the downside when I move to the bottom. I think that is because it is detecting also the top/bottom corners. How I can prevent this corner collision to allow to the player to slide? Currently, my code is the next one (using xMove (-1 or 1) and yMove (-1 or 1) to know the player movement direction. Best regards, Thank you in advance. 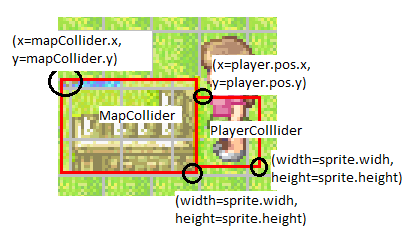 Your tests for top/bottom collision are only false if mapCollider.y == playerCollider.y, i.e. if their tops are exactly aligned. However, this doesn't indicate whether a collision is occurring in that direction, you need to be testing for the edges of your bounding boxes, not just a single point. Note that only one of left/right collision should be true at a time, unless the player completely inside the object. Also, some version of this is very likely what the intersect function you are calling is doing, is there a version that returns the intersection you can call? Or otherwise you might want to replace it with your own code. Not the answer you're looking for? Browse other questions tagged java 2d collision-detection collision-resolution or ask your own question.